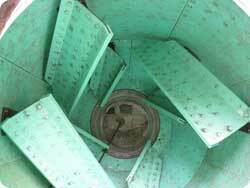 The Evolution mixer drum liner features Argonics’ unique Kryptane formula and uses more weld plates along the edges to reduce concrete penetration under the liner. 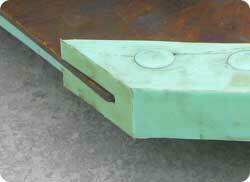 Weld plates are securely anchored in the liner, ensuring a secure liner fit. Our blade liners are made from the same material as the Evolution liner, so they have the same wear properties and use the same Snap-Tite™ plugs. Argonics guarantees 100% that Evolution will never delaminate. Wrap-around blade liners prevent concrete migration underneath the liner and eliminate the need for steel flat bar edge protection. Available for all major mixer manufacturers’ drums and made with the same Kryptane® polyurethane as the Evolution liner.